While the Lower Ninth Ward, New Orleans East, Lakeview, and Gentilly were the areas hardest hit by the post-Hurricane Katrina flood, other sections of the Crescent City were pretty well slammed as well. 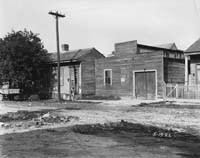 Mid-City, for example, had flood depths ranging from four to eight feet. Anyone driving to the Main Library along Tulane Avenue cannot help but notice the dark, black floodlines marking many buildings six feet or so above the street level. Tulane Avenue is one of the main Mid-City arteries. Before the completion of Interstate 10 through the New Orleans area it was the "express" route to the center city from the New Orleans International Airport. Over the last thirty years or so, though, the character of the street has changed. The massive Criminal Court Building and the Dixie Brewery are still there, although the future of the latter is uncertain post-Katrina. The thriving medical complex on the river side of I-10 is still there but the future of its anchor, Charity Hospital, is uncertain at best. Many of the motels and other businesses that lined the avenue had closed down, changed uses, or otherwise deteriorated even before the storm. Few have reopened for business seven months after Katrina's passage. 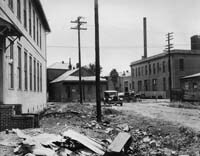 This month's gallery makes use of two small sets of photographs, both from the 1920s, that show sections of the Tulane Avenue corridor as they were undergoing change even then. 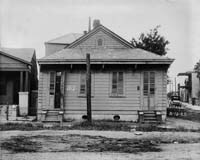 The first set, taken in 1922 (and subsequently damaged by being folded in half for pre-City Archives filing purposes), shows the neighborhood around the intersection of Tulane and Hagan (now South Jefferson Davis Parkway) Avenues. They were submitted to the Commission Council, possibly in connection with a proposed expansion of the city's Municipal Repair Plant located on the New Basin Canal near Clark Street. 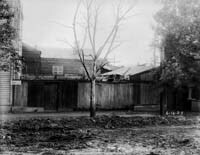 The second set, taken in 1925, shows buildings in the vicinity of Bertrand and Gravier Streets. They were submitted as evidence in an unidentified court case, perhaps dealing with impacts on the neighborhood from the reconstruction of the nearby Hotel Dieu hospital. We have also taken new photographs close to the areas shown in the original 1920s views (click on the full size images to see the recent photos) in order to give an idea of how the 2005 flood affected the area. Available flood depth maps show that the vicinity of Tulane Avenue and South Jefferson Davis Parkway had between five and six feet of water while the Tulane Avenue and South Prieur area had between four and five feet. Suffice it to say that very little in either neighborhood has reopened to residents or for business--seven months after the hurricane!